Event Format: 3-Game Guarantee. Pool Play to Single Elimination Finish (can re-format based on weather conditions). Division 1: This is our most competitive division which includes "Select / Elite" teams and is also open to any team that wants to compete. Game Times Available: Monday, April 1, 6 p.m. MT. Roster must be COMPLETE online Wednesday before the event. All rosters should be done online. You can create a roster by clicking the word Rosters and enter your user name and password. If you do not have a user name and password you can create one by following the steps listed under the Roster section. Each team must carry a packet of birth certificates throughout the tournament. Each team must supply two new baseballs and one used baseball per game. Remember to get your baseballs back after the game. A minimum 10% non-refundable processing fee will be charged on all refunds. If you call between the dates of January 1 and February 1 you will be refunded 75% of your entry fee. If you call between the dates of February 2 and March 2 you will be refunded 50% of your entry fee. If you call after March 2 no refund will be given. WEATHER CANCELLATIONS: There is a chance this tournament could be rained out. Please be aware that 20% of the entry fee will be kept to cover administrative costs if tournament is cancelled. If your team plays 1 game, there will be a 50% refund, if your team plays 2 or more games, there will be no refund. In the event of weather, the entire amount of your entry fee can be transferred to another Corporate run Triple Crown event (pending availability); if you transfer to a Franchise run event you will be charged the administrative fee mentioned above. 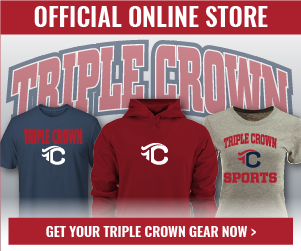 Since 2010, Triple Crown has called Central Washington "home" for the annual TCS NW Baseball Series Season Opener! In 2017, a RECORD 135 teams enjoyed the great activities, facilities, weather and baseball that this premier event has to offer! Don't miss your own opportunity to participate in this early season tournament in dry weather conditions. Enjoy the mountain fields, and sink your teeth into an apple in the "Apple Capital of the World!" Teams in age groups 8u-14u will get the top level organization and programming of Triple Crown Sports (rain or shine), and the coveted berths to the World Series in Steamboat Springs, CO (8's, 11's, 13's, and 14's) and Park City, UT (9's, 12's) later this summer.